Action from the Under 14 game between Thorney and Oundle, which Oundle won 3-2. Emmanuel Ochube has been a sensation in front of goal this season for Netherton Phoenix Under 13s. His remarkable record of 55 goals in 19 games has kept the city side in the thick of the Division Two title race. 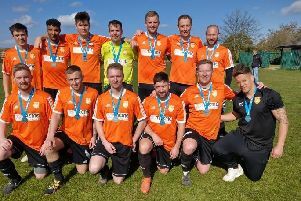 But even though Ochube smashed another five in a 6-0 win over Northern Star White on Sunday, it’s now almost certain that the Netherton lads will have to settle for runners-up honours. The title looks to be on its way to Colsterworth. The Lincolnshire side beat third-placed Spalding 4-2 to maintain their four-point cushion over Netherton and there are only two more games to go. It was a good day for the two Park Farm Under 13 teams on Sunday. Division Four champions Park Farm Black completed their league programme in style. They hammered Holbeach Black 9-1 to make it a deadly dozen wins fro m 12 games. Gediminas Kozik fired a treble and the other goals came from Peter Duda, Robert Facuna, Ben Lane, Daniel Sot, Lacko Stanislav and Mikolaj Burnac. Stanislav (29), Sot (28) and Kozik (22) all finished with more than 20 goals. Park Farm Red kept their Division Three title hopes alive when beating Crowland 7-1 to close the gap on leaders Northern Star Black to one point and they have two games in hand. The goals against Crowland came from Riley Deadman (3), Callum McAuley (2) and Liam Nightingale (2). Deeping Blue are through to the Under 12 League Cup final after beating Division One rivals Netherton in a thrilling semi-final. Netherton led 1-0 at the break thanks to a goal by substitute Johnny Halfhide-Smith, but Deeping equalised through Archie Rickards. That meant a penalty shoot-out and it was Deeping who came out on top 4-2. The other semi-final is between Baston and Riverside. Whittlesey Blue are closing in on the Under 12 Division Two title. They have moved 18 points clear at the summit following Sunday’s games. While they were hammering Malborne 8-0, second-placed Young Dons were losing 4-1 at Werrington. The scorers for Whittlesey were Nathan King (4), Joe Sheridan (3) and Zachary Roan.